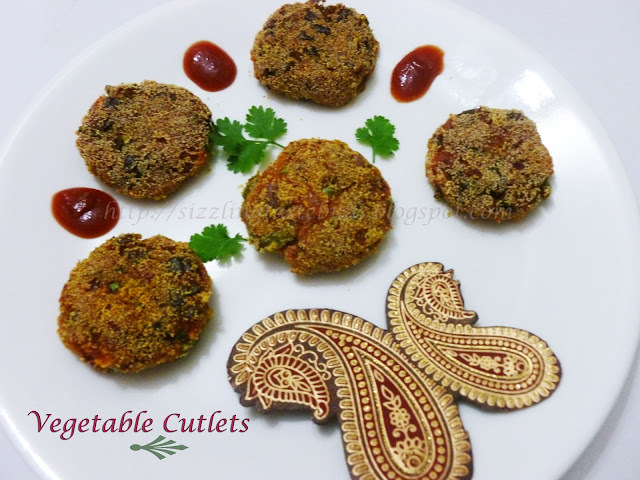 Mixed Vegetable Cutlet is the best healthy way to blend the vegetables with other spices and present it to fussy kids who hate vegetables. As a kid, I always loved this wonderful tasty vegetable cutlets. Its still my favorite and will always be. Learnt this from a TV cookery channel before my marriage and I still follow the same method. 1. Take all the vegetables and cook it in a microwave safe bowl with little water and salt. 2. Heat 2 tsp oil in pan. Add chopped onions and saute it for a minute or two. 3. Add Ginger- Garlic paste and saute it for another minute. Switch off the flame. 4. Drain excess water used for boiling vegetables. Mash the vegetables and add in all the dry spices mentioned except rava(semolina). Add Corn flour and sauted onions. Mix well to bind all together. 5. Take a small portion of the mixture and make round shaped ball out of it. Slightly flatten it between your palms and place it on a plate seperated with rava. Coat both sides with rava and keep aside. 6. Similarily, continue with the previous step for remaining mixture. 7. Heat a frying pan and place these cutlet shaped mixture on it and shallow fry with little oil till they are cooked and turned golden brown in color. 8. Drain it and then place it on an absorbent paper. 9. Serve hot with Pudina Chutney or Tomato Ketchup. Note: You can use the water used for boiled vegetables for any vegetable soup or curries. Add in any vegetables of your choice. Bread crumbs can also be used for coating the cutlets instead of rava. Vegeable cutlets looks very rich, as if we are sitting in the wedding party.. great work..!